The last few days I worked on the MCP23017 kernel driver and wondered about a good method to test my changes in a comfortable way. 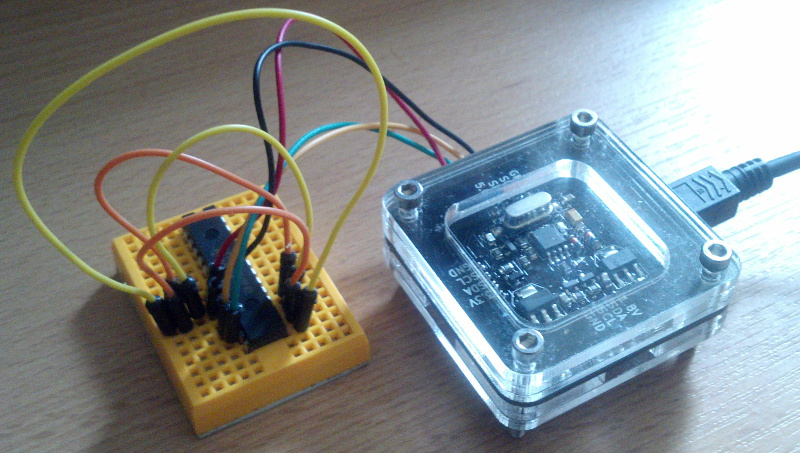 Fortunately I built myself an i2c-tiny-usb adapter some time ago, which is supported by mainline Linux. Thus any system with USB host support could be used for testing the above chip. My minimal test-setup can be seen in the image below. Basically I supplied 5V, Ground, SCL & SDA from the adapter to MCP23017, connected the low-active reset pin to 5V and the address-selection pins to Ground. The obvious platform would be my development notebook, but rebooting for every test is a annoying. Kernel developers working on scheduler e.t.c. often use qemu for testing, so I wondered if I could do the same by forwarding the USB device. Also I do not want to spend time for configuring a rootfs for the emulated system. Thankfully Andy Lutomirski wrote virtme, which takes care of this by using the normal rootfs. I created a Debian package, which can be found on the following git repository at collabora. # cache, since regmap does not know about the power-loss. So my patch moving to regmap based caching work as expected and surpass the original driver, since it can detect & fix context-loss scenarios in debugfs :) While those are quite unlikely to appear on production hardware, MCP23xxx is commonly used by hobbyists and their hardware is often less stable. As a by-product of my work on mcp23xxx I also had to fix i2c-tiny-usb, though. Before kernel 4.9 the driver worked flawlessly, but since then it will complain, that the transfer buffers are not DMA capable. A patch for that has been sent and will hopefully be backported. All in all I must say the virtme based testing was really nice and I hope I can use it again.